Pamper your interior with the utmost in care! Safe on high quality leather such as late model Ford trucks with King Ranch leather. Pinnacle Black Label Hide-Soft Leather Kit. The Pinnacle Black Label Hide-Soft Leather Kit is an inclusive kit designed for automobile owner's who enjoy the comfort of rich, subtle and natural feeling leather. The Black Label Hide-Soft Leather Kit contains the utmost in leather cleaning, conditioning, and protecting technology. Don't clean and soak your leather with petroleum-based leather products that do more harm than good, pamper your leather with Black Label. Leather that has been properly maintained and well persevered will exhibit a natural feel and very fine aging marks. 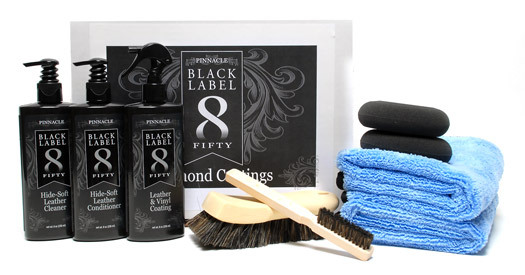 The Pinnacle Black Label Hide-Soft Leather Kit sets a new standard in leather care. It is a standard you will enjoy each time your pilot your favorite automobile. Black Label leather care products represent a new standard in leather, vinyl and interior care. It is a standard your automobile deserves. Pinnacle Black Label Hide-Soft Leather Conditioner represents the finest in leather care. This conditioning and protecting cream bathes leather in a luxurious coating of natural mink oil and lanolin to hydrate any exposed hide, while creating a moisture-resistant breathable barrier. Hide-Soft Leather Conditioner is ideal for coated, semi-aniline and full aniline leathers. The Natural Horse Hair Interior Upholstery Brush is extremely soft and packed with thousands of genuine horse hairs. The super soft hairs are perfect for delicate leather, vinyl, cloth, and scratch sensitive plastics. The Natural Horse Hair Interior Upholstery Brush works well on all interior surfaces. You can use it dry to dust and brush away grime, or use it with Black Label Hide-Soft Leather Cleaner for improved cleaning power. Either way your vehicle will feel pampered by these amazingly soft hair bristles. The Horse Detail Brush is packed with thousands of genuine horse hair bristles that gently clean leather, vinyl, cloth, and plastics. The soft bristles loosen soil and agitate leather�s pores to release body oils. Slim profile enables this nifty brush to get into cracks and crevices, leaving your interior cleaner than it ever has been. Use these ultra-soft Black Foam Applicators to apply Black Label Hide-Soft Leather Conditioner over leather surfaces or to apply a fine coat of Black Label Leather & Vinyl Coating to coated leather and vinyl. The Black Foam Applicators are extremely soft and will not scratch even the most delicate leather hides. Miracle Towels are not just an ordinary microfiber buffing cloth. They are ultra-soft and extremely thick tools designed to pamper surfaces with scrubbing. Use the Miracle Towels in this kit to clean, condition, or treat any leather or vinyl surface in your car with the utmost care. Because each Black Label product in the Pinnacle Black Label Hide-Soft Leather Kit has been formulated to protect the most delicate materials in the highest-traffic areas � your automobile- it is perfect for use around the house as well. Use Black Label leather care products to protect and preserve any leather finish, from office chairs to premium handbags.